La Vie Aventureuse: How To Cook Sticky Rice... Properly! I was taught how to cook rice the "Korean way" with medium grain white rice by some Korean friends that I met who were travelling through Australia. They had stayed at my uncle's accommodation business in rural South Australia as tourists and he spoke to my mum about seeing us when they got down to Victoria. And then they stayed at our house in Melbourne for a couple of weeks. We have remained friends for several years now and I have met up with them (there are three: two sisters and a brother) in Korea (Seoul and I travelled also to Busan on one occasion) numerous times on my travels since 2010 to the present. My mum has also had the opportunity to meet them again when she was visiting me in Europe as a stopover. Their friendship has truly been invaluable. As we did not have a rice cooker at the time my friends were staying with us, we used a normal saucepan for the "Absorption Method". Firstly, you need to wash the rice. Add however much rice you wish to cook (ie. one cup per person) and add water from tap. Position your hand into a fist and using your knuckles and closed fingers move your fist against the rice to ensure that the rice is being cleaned. The starch will be coming out of the rice making it milky. Then you need to release as much of the water into the sink and continue with this process. I tend to wash the rice four times or until the water is clear (depending on how lazy I feel). Once ready, add water to the rice to be cooked. Make sure there is about one centimetre of water above the rice. Not too much otherwise the rice will become soggy. It is not like cooking other types of rice like basmati. Add the saucepan to the HIGHEST possible setting on the stovetop. Wait until the water begins to boil and then turn the heat right down to the LOWEST heat and place a lid onto the saucepan. It would be ideal that the lid has a hole or a section for the steam to come through so that the saucepan does not bubble over. Monitor the rice but it takes about 15-20 minutes. Check the rice is fluffy and sticky. Sometimes, it is nice to continue cooking a little bit longer so that the rice on the bottom is crunchy and golden. To clean the pot, you can add a little bit of water to simmer on the stove. 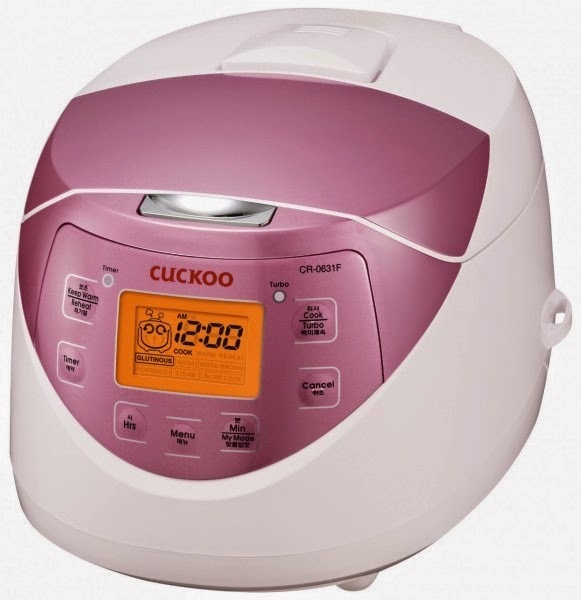 If you have a rice cooker, fantastic! It will cook it for you and 'pop' up when it is ready. I think a rice cooker is an essential item in Korea. The brand used is called "Cuckoo" and they are AMAZING! IT ALSO COMES IN PINK! 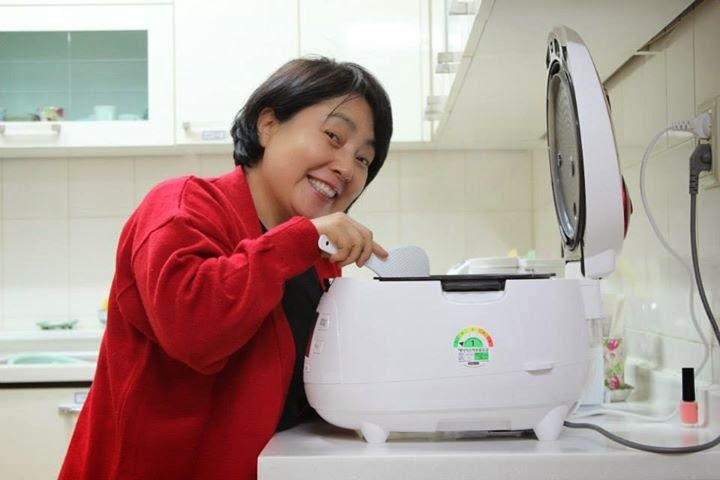 Crystal, my Korean 'umma' who I met in 2013 whilst in Seoul who is posing beautifully with the Cuckoo rice cooker.